The process of installing custom content in The Sims 4 is relatively easy. This detailed tutorial will show you all the necessary steps for using the houses and lots that you have downloaded from our site. Most downloaded files will be in a compressed format such as .rar. You will need WinRAR or 7-zip for this, so get one of them if you haven't already. Both programs are free to download. 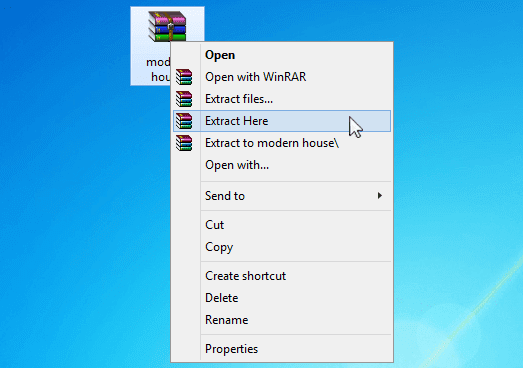 To decompress the file, right click it and select Extract Here. 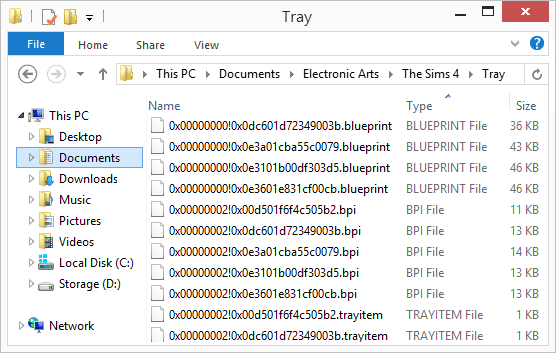 For Houses/Lots - You should place the files in to the Tray folder, which can be found at Documents » Electronic Arts » The Sims 4 » Tray. Example of file formats that can be found inside the Tray folder are .blueprint, .bpi, .trayitem, .room and .householdbinary. Custom Content files (CC) - You should place the files in to the Mods folder located at Documents » Electronic Arts » The Sims 4 » Mods. Files in .package format should be placed inside the Mods folder. You will also see a config file named Resource.CFG, which basically allows users to add third-party content. That's it. After you copied the files in their designated folder, the downloaded content are ready and now available for use in game. You don't have to restart the game every time you install a new creation. Simply refresh your Library and it will appear right away. MoveObjects On - Some house creations require this script in order to place the lot properly. You can download it HERE. To install, simply copy "tmex-moveobjects.zip" into the Mods folder. Do not extract or unzip. To enable, go to game options > other > and check the Script Mod box and restart TS4. It is on by default but you can use the command "tm.moveobjects off" to disable it. Open the Gallery (F4 key shortcut) and select the My Library tab. On the left side of the screen, look for Advanced menu and make sure that the Include Custom Content box has a check mark in it to see creations that include CC. Now all you need to do is place the house on a lot and your Sims can now move in. You need to be in Build Mode in order to do this. Also, be sure to have sufficient funds (if lot is occupied by household) and the required lot area. You can place the new house in to a vacant land or replace an entire existing home. And that’s a wrap! I hope you enjoyed this guide, and learned how to install custom content in The Sims 4. Don't forget to check out our collection of awesome looking residential houses and community lots. - Try restarting the game. - Bulldoze the lot a couple of times to make sure it's clear. 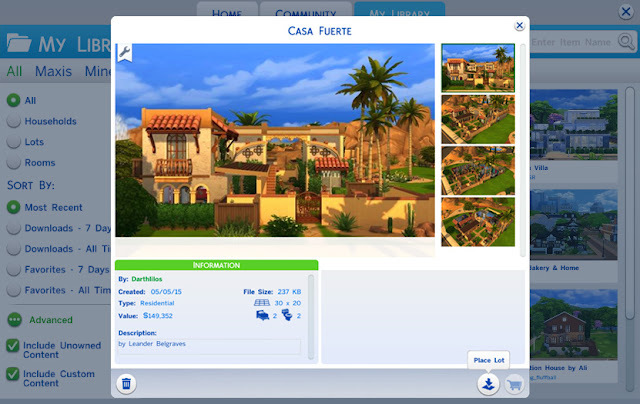 - You must be in Build Mode before placing the lot (while in build mode, click the Gallery button, go to My Library and find the house you want to place). I've done those steps but still says system error. is it beacuse I don't have any extention packs but these downloadable lots probably does? Help please! When I open my gallery I cant find my downloaded sims or lots anywhere, I clicked on advanced show cc, what am I doing wrong? That is because a lot doesnt work in a mod folder it works in the Tray folder. I have tried this and works for me. You double click it and unzip it. If it is under a pc format download stuff expander from the app store. Then you'll get a folder. If it is a household put it in the tray folder without the folder it came in. If it is cc or mods put it in the mods folder. If you dont have any of the folders make them in the sims 4 folder which should be in your documents. You have to update your game to newer version , if you have origin you have to download The Sims 4 from there when its done you have to right click on it and select update. It means the whoever made made it with a newer version of your game. If you can update it and if you have a cracked version go to the ultimate fix to update you game. Otherwise just find a different cc. Hi, I'm having problem with this one. It says that "cannot place a content because it was created with a newer version of the game...."
It says in the error message. "Newer version of game" update your game! when i open my gallery the only thing that comes up is my houses that i have build and i cant go and download form other people, i have an sims accont and an origin accont ut it sill dont work, help!!!!!! WE DID AND IT STILL ISN'T THERE!!!!!!!! It lets me download the house itself I always make sure to download the houses that also have the custom content in the home however when I place it in the game the house stays but all the custom content disappears what am I doing wrong? Does this work on MacBook? Bonjour, j'ai extrait les fichiers des dossier zipper et je les ai inserer dans le dossier Tray des Sims 4 Mais je n'arrive pas a les voir dans ma gallery dans le jeu :(, une idée ? It worked wonderful...Thank you for all your help! Where do you put the .hhi and .sgi files ? 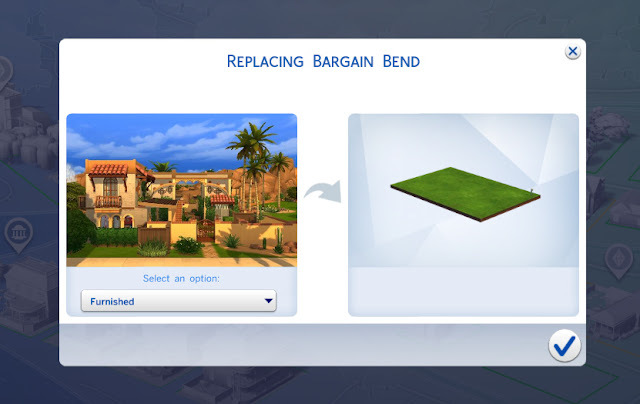 If the lot has CC with it, will the automatically download with the house like in Sims 3? Or do I have to download each piece individually? 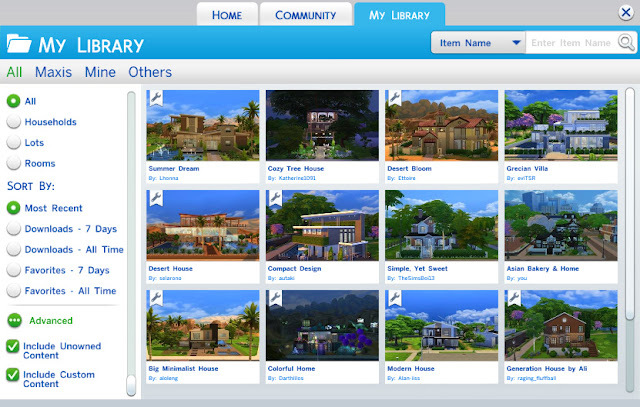 Hopefully the creator of the lots will leave the names of the CC in the description. if you have mac, download Keka. it's works the same. 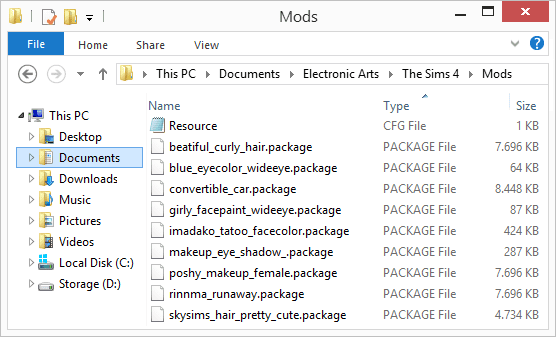 i have a cracked version of TS4 by fitgirl repacks, i have no mods folder because my game files are mostly extracted is there any way to create a working mods folder in my game ? hey is this house compatible with my version of sims 4.my version is 1.5.139.1020....anyone. What house are you talking about Hanizah? I downloaded a lot and I see it in my library and when I click on it says "cannot locate file" please help! I am unable to see any of the cc lots i downloaded form TSR, and yes, I have enabled custom content in the advanced setting, and i have both cc and script mods on. I have noticed I do not have any Resource.CFG in my tray folder, could that be the problem? I am unable to see my cc lots downloaded, and seeing as I have every needed box checked the only reason I can think of for beeing unable to see them is because i do not have any Resource.CFG file in my tray folder, could that be a problem? I am getting really irritated not being able to use downloaded lots. I download a house and when I look in the libary I have to choose advanced and then I include custom content and unknown. But I can only inculde custom content and there is nothing that says unknown content. What do I do? I have a problem with manually downloaded custom lots and also with custom sims not showing up in the library :( They are .trayitem, .hhi, .sgi / .bpi, .blueprint files, etc, and I put them into the tray folder without subfolders. Custom content is enabled in options and library. Script mods are enabled. Still, it doesn't work. They just don't show up! I've been googling for hours now and couldn't find a solution :( Can anybody help me? Thanks! Hi, thank you so much for the instructions but I keep encountering an error; if anyone could help me that would be much appreciated! When I try placing the lot into my newly bulldozed lot in the Map (by going to Map --> Gallery --> Place Lot), it'll load for a sec and then go to the replaced lot. But when I get there, it's still an empty lot. I tried placing the lot by going into build mode on the empty lot and choosing from the gallery there, but when I try placing it a red bubble pops up and it says 'System Error'. Hi, thank you so much for the instructions but I keep encountering an error. If anyone could help me that'd be much appreciated! I went to the lot to enter build mode, then bulldoze it, and open the gallery. Then I chose my downloaded house and I clicked "Place". However, a red bubble pops up and it says "System Error". This happens even when I try to place an unfurnished version. I've also tried to place the lot from the Map by going to the gallery when I'm not on the lot, but it loads for a second, goes to the lot, and it'll still be an empty lot. I found out that for those who have the 'system error' message, it's because you're trying to download a lot that was built with a more updated version. Since a lot of you have cracked versions of the game, it's not entirely up to date. 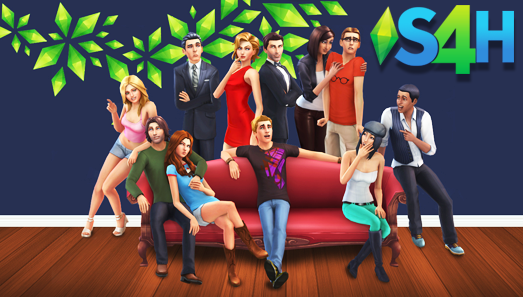 What you should do is go into you Electronic Arts folder --> The Sims 4 --> GameVersion.txt. Once you open the game version file it'll tell you what version you have and therefore you should search for lots that were built using that version. Then you'll have no problem in placing anything! I have followed all these steps and I can't find my house anywhere in the gallery help! Ive got the game cracked from fitgirl repack how to do I install mods?